Finally! Ancient History Beyond the Mediterranean! 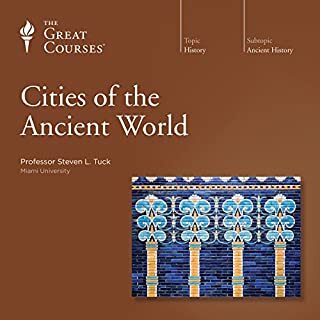 I’d recommend this series to students new to ancient world civilizations as well as established ancient history lovers in search of a true global perspective. Unlike so many ancient history courses this course address civilizations outside of the Mediterranean and Near East! This series includes lectures on India, China, and the Americas. The professor even touches briefly on ancient cultures in Polynesia and Australia! The course is organized chronologically, and that works well for emphasizing that multiple ancient civilizations were simultaneously flourishing in different parts of the world. 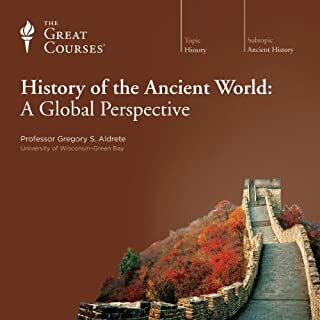 The general history lectures give us a good basic knowledge overview of each civilization and that foundation supports the lectures where the professor makes cross culture comparisons. These comparison lectures are where this course really shines. The full lecture list is below. Highlight lectures for me include: Homer and Indian Poetry, Confucius and the Greek Philosophers, Mystics, Buddhists, and Zoroastrians, Han and Roman Empires, Pots and Pyramids—Moche and Teotihuacán, Hunter-Gatherers and Polynesians, and Comparative Armies—Rome, China, Maya. 41 The Decline and Fall of the Roman Empire? 48 Endings, Beginnings, What Does It All Mean? "The Histories," by ancient Greek historian, Herodotus, is full of myths, folklore, legends, historical facts and tall tales. Herodotus basically traveled around the ancient world asking people questions about their lives and cultures and histories, and then wrote down whatever they told him. Because of this reporting style he is known as both the Father of History and The Father of Lies. Whether he records true tales or tall tales, it is interesting to know what ancient people said and thought about their world. He covers a lot of ground, figuratively and literally. His writing style flows like the Meander river; full of twists and turns. 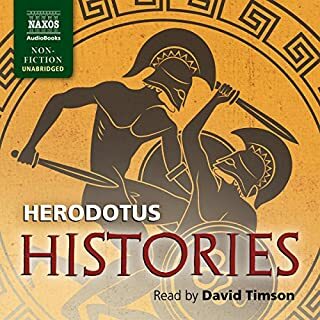 I've listened to all the versions available on Audible, and David Timson's narration is best suited to Herodotus' tangential asides. His conversational style is engaging and enthusiastic. It's nice to hear someone giving the proper excitement for topics like the Battle of Marathon, Persian Culture, Egyptian Culture, Peloponnesian War, Greek-Persian Wars, the Artemesium battle, the Amazons and the Spartans at Thermopylae. This one's for the fans! This is a high quality recording of a textbook being read aloud. There were no ums, ahs or annoying & distracting noises, but neither was there any enthusiasm from a monotonous narrator. Both the data and presentation style are traditionally objective and the tone seems slightly removed from the subject matter. Facts about people and events are mentioned in passing without any indication from the author that they are links in a chain to future things. I felt it was organized as things just happen, one after another. It is 32 hours of who, what, where and how, but rarely any why. There was no indication that the author felt that any fact was more important than or related to any other, so it was difficult for me to place the facts into a comprehensive historical narrative. There wasn’t enough thematic structure for me and all the information ran together to become an unappealing and overwhelming fact blob. 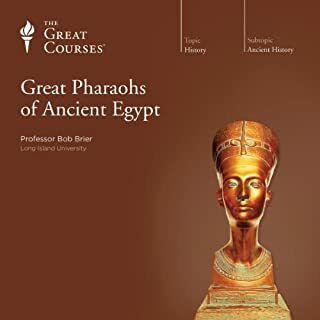 If you want to learn more about Egypt, Greece and Rome, I recommend that you use your credits to purchase 32 hours of the many other excellent ancient history books or courses available on audible. Audible has so many better choices! 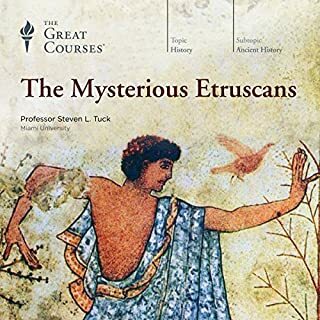 What did you love best about The Mysterious Etruscans? So much is still unknown about the Etruscans, but this lecture series gives a nice overview of recent archaeological finds and academic scholarship (up through 2015). The course focus is cultural and its organization is thematic, which works well and is appropriate based on our knowledge or lack thereof. I always appreciate how Professor Tuck discusses the generally accepted theories while including his own thoughts and presenting interesting alternative theories. Importantly, he also highlights areas that are still a total mystery. We haven't yet solved the Etruscan puzzle, but I enjoyed this enthusiastic presentation of newly found pieces. 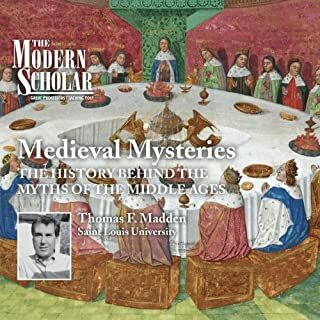 We still talk about all of these subjects in modern pop culture, and I didn't need any additional outside knowledge of Medieval times to understand and enjoy the lectures. Watch out for me at my next cocktail party! Have you listened to any of Thomas F. Madden’s other performances before? How does this one compare? I really enjoy listening to Thomas F. Madden. His courses are well organized, focused, and arranged in a way where the themes are easy to follow. His courses are wonderful for someone who is new to the subject matter. He presents me with what I need to know and doesn't go off on academic tangents. His lecture style is engaging while being neither over the top nor dull and dry. Also, the recording itself didn't have annoying vocal tics. 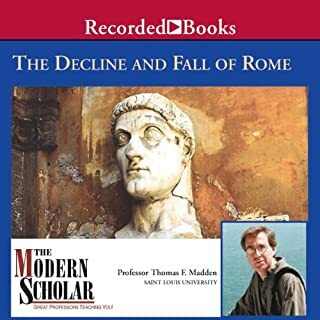 In this informative and lively series of lectures, renowned history professor Thomas F. Madden serves as the ultimate guide through the fall of ancient Rome. Professor Madden correlates the principles of Roman conduct that would forever change the world. Rome was an empire unlike the world had ever seen, and one that will likely never be duplicated. Peopled with personages of great distinction and even greater ambition, the Roman Empire contributed many of history's proudest advancements. Good general survey, a lot of names. Although the title says "Decline and Fall," this lecture series is not just a summary of Gibbons' famous work of the same name. This series focuses on governance and political power. Military History, Scandals, the Arts, Religion, Famous Biographies, Technology, and the Culture of Daily Life are only mentioned if they have direct relevance or influence on the ebb and flow of power during the 500 or so Empire years. Professor Madden presents a clear and easy to follow explanation of who held power in Rome from the death of the Republic to the Barbarian removal of the last Emperor of the West. He traces the rise and fall of dynastic imperial families like the Julio-Claudians, Flavians and Antonines. He explains the military's power to decide the Emperor of their choice. He explains how prominent Christians went from dying in the arena to living and ruling in the palace. And finally, he illustrates how Rome's international relations with Barbarians led to the final sacking and the end of imperial self-rule. This lecture series isn't a bells and whistles account of all the crazy things that occurred during the Roman Empire. It's a clear and concise framework that puts the trivia into context. This is basic knowledge that will enrich listeners' understanding of any further encounter with information about the ancient Roman Empire. This is the bare historical foundation that's solid enough to let you build on it as high as you please. Archaeology generally explores what can be learned about people based on their personal or cultural objects, but this lecture series explores what can be learned about a group of people based upon their physical surroundings. Why does a population to plan and design their city in a certain way? What do those choices tell us about the people? How does the design continue to influence and impact the population living there? How do cities from different eras compare? How do cities from the same civilization differ from each other? How do different social and economic classes differ within the same city? The professor looks at things like geographic location, building materials, civil engineering, socio-economics of neighborhoods, zoning issues, municipal infrastructure and resource accessibility to gain knowledge about its inhabitants. Each city lecture illustrates an aspect or universal theme of city living or lessons about the evolution of urban planning, or gives us insight about the inhabitants and what we can learn about them based on how they lived. The professor’s lecture style is more conversational than academic and occasionally he is more enthusiastic than organized. Even so, I thought his delivery worked well with the subject matter, which might be very dull with the wrong type of narrator. I found his enthusiasm contagious and enjoyed thinking about how my modern city life compares and contrasts with those in some of the ancient cities. Where does Ancient Empires before Alexander rank among all the audiobooks you’ve listened to so far? I listen to a lot of ancient history lectures. Some are broad, some are basic, some are thematic, some are popular, some are casual. This series is serious. This isn't an "aren't-the-Greeks-amazing," "how-the-Romans-are/aren't-like-us," "Egypt-is-cool" lecture. Don't get me wrong, I love those lectures, but this is University level serious. This is a deep dive into the ancient bronze age superpowers of the Mediterranean and Near East. Every lecture has so much critical information packed in. I needed to stop more than once and consult maps or just pause to take it all in. The lectures are organized chronologically by civilizations. Some time periods overlap as he follows each empire's timeline from rise to fall. It was helpful for me to listen to a set of lectures for one empire and stop rather than binge on them right after another. I've listed the lecture outline below. Standouts for me were the Kingdom of David and Solomon, The Mitanni, Every Lecture on Hatti (the Hittites), The Collapse of the Mycenaean World (interesting Sea Peoples ideas), Every lecture on the Assyrians, and the Carthage and early Rome lectures (interesting from the Carthaginian point of view). All lectures are rich with essential details and not much fluff. 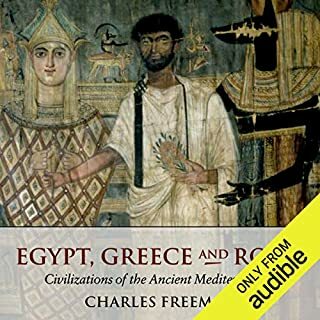 If you are not already into the ancient world, you might hate this and I'd recommend another audible choice. 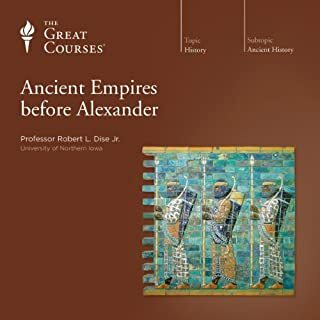 If you are into the ancient world, I recommend Ancient Empires before Alexander as *THE* advanced course. I absolutely love this series and it's the one I refer back to for comparison to any new ancient world media I come across. The course focuses on early Rome's legendary heroes and founders. It is not stories about the Roman versions of the 12 Olympians. This course would be a good supplement for anyone interested in Rome's earliest days, as reported by the ancient historian Livy. It also might be of interest to anyone wanting to know more about the heroes like Brutus, Romulus, Aeneas and the Trojan War Settlers, Cincinnatus and Coriolanus, that are name-checked by Senators during the Roman Republic. Lecture 8 Etruscan Kings in Rome: Myth or History? 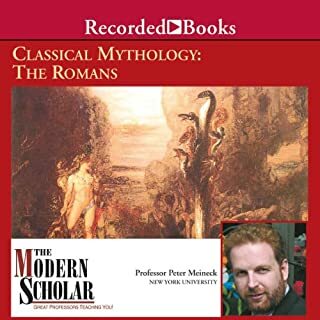 This series of lectures is best for someone who already knows a little bit about Roman mythology and/or early Roman history, and wants to take the next step. Since such a small amount of early Roman history has survived, this course looks for that information in Rome's myths and cultural tradition.